With over 30 years’ experience in commercial and private storage, we know how important your stored items are to you. Our storage containers are modern and well maintained..
Each container has high vents to deter moisture and is secured with thick metal doors and dual opening for easy access. The container doors are sealed with double wall rubber seals, ensuring a dry trouble free environment for your important property. After these times the automatic security gates are closed and there is no access. All containers are subject to availability. Units are available in a range of sizes and are level-sited on a tarmacadam site. 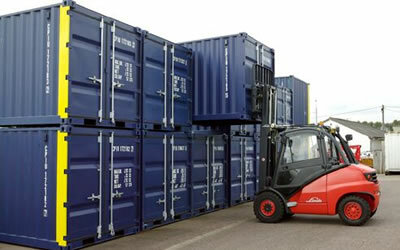 There is a 5 tonne forklift facility on hand, so manoeuvring and stacking of goods is no problem (with an advanced booking, at a minimal cost). 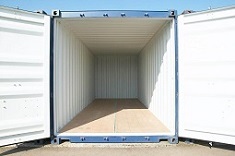 Fluorescent lighting and 240v metered electricity supply are available in the 40ft containers. The containers are situated behind two security gates. 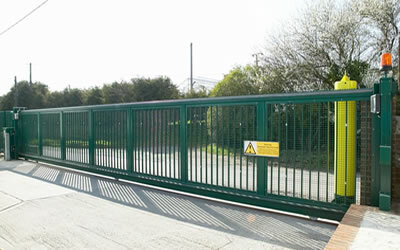 The electrically operated main gate is timed and only allows access to specific personnel outside of opening hours. In conjunction with the gates, the site is under 24 hours, recorded CCTV surveillance and has a resident caretaker, so you can feel safe in the knowledge that your stored goods are secure. For extra peace of mind, you are asked to provide the padlock for the container and therefore have sole access to the items stored within. There are a number of insurance companies that provide cover for personal belongings stored in self containers. One company that we recommend is Insurastore.com. They provide low cost flexible insurance and are underwritten by RSA. Visit the Insurastore.com for more information. All containers are subject to availability. For prices and information on current vacancies please contact us by email or phone 01903 245 025.